perhapablog... and other ramblings: johnny! and now imagine that your dad just happens to be a fairly well-known comic book artist for marvel comics and that, hey! maybe he could sketch you up something fun featuring your favorite web-slinging super hero for you to color!! how lucky is this kid? he's starting to realize that everybody's father doesn't draw comics...but only just. oh, also, he sends it off to his uncle todd who decides to exploit both of their talents one friday on his blog. 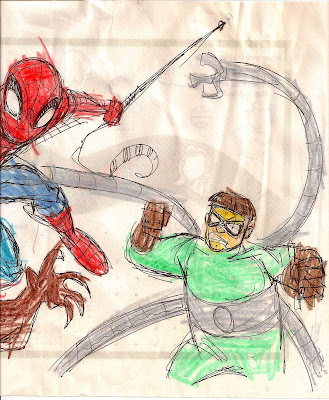 here ya go--spider-man battling venom and doctor octopus on a placemat by craig and johnny rousseau! so it started with johnny and me comparing our action figure collections last fall. when he would come to visit here or i would go to visit there, he and i were always playing with the action figures. i had taught him all the cool games to play with them that i had made up with my now older niece and nephew; bowling for action figures, hide and seek with action figures and, of course, making your action figures beat the heck out of each other. big fun, everyone should try them! being 5, johnny always had more action figures than me, but that's mostly 'cause he has more time on his hands. (for the longest time, it didn't impress him that his dad and uncle todd actually had something to do withy the comics he was reading, that came later...) now though, johnny was introducing me to his vast collection of the animated spidey and his many foes and, as fate would have it, these tiny squashed looking versions of the marvel heroes called the super hero squad! johnny had 'em all! 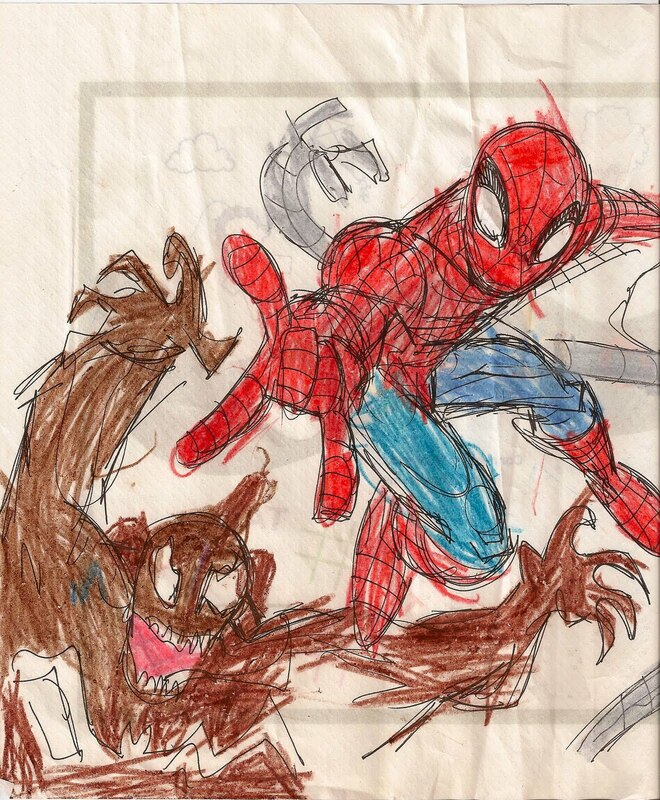 after our last visit, back in november, johnny started drawing some of his favorite spidey foes for me and having dad send them over in an email. great stuff! gangster and robot versions of rhino and kraven--just too cool for school! i loved 'em! then, while we were chatting on the phone, i told johnny that he should pose his action figures and take photos of them like peter parker! so now we had a cool new game and johnny was putting me to shame. the other day i finally got my spidey figures out and put together a couple of scenarios that you might enjoy...here are my pics for the daily bugle along with my captions that jonah will probably change...! DOC OCK HAS SPIDEY ON THE MAT!! THE HIGH-FLYING VULTURE SOARS EVER HIGHER...BUT SPIDEY HANGS ON!!! SPIDEY PUTS ELECTRO WHERE HE BELONGS--BEHIND BARS!! i'll be here on monday with an alice in wonderland update! As I've told Suzanne many times, Johnny Rousseau is the coolest name any kid has ever had. The Greeks are gonna be all over him! Stupid iPhone. I said girls not Greeks. WTF! Gotta say, "girls" makes a lot more sense than "Greeks", and Johnny'll probably appreciate their attentions more when he gets older too! I *love* the design for that line of action figures. So clean and crisp. The cartoon was one of the best out there as well. LOL! Matt, I thought you were making some sort of obscure reference to college frats recruiting him. Love the pics -- all of 'em! Looks to me like Johnny is already learning the craft. I have my own Marvel Superhero Squad figures set up in groups -- X-Men, Avengers, Defenders... I wish DC had something similar. But then, they used to have those great JLU figures. Man, I miss that show. "Spider-Man Assists Sandman In Break-In!!!" "Spider-Man Carried To Safety By The Vulture!!!" "Spider-Man Visits Electro In Jail!!!" These four panels alone are better than any Amazing Spider-Man issue coming out today!!! That is awesome! Johnny's very lucky. Let me just add that the talented art duo of Rousseau and Son will be making an appearance at the Boston Comic Con this weekend if anyone is in the area and would like to see this dynamic duo in action live and in person.